InterVision Systems Technologies Inc. is an innovative data center and corporate infrastructure solutions specialist with expertise in leading-edge technologies and services. In addition to selling hardware solutions, the InterVision Professional Services Organization has developed a proven methodology for designing and implementing end-to-end technology solutions for data centers, enterprises, service providers, and e-businesses. As a trusted advisor to our clients, InterVision offers best-of-breed solutions in Virtualization, Cloud, Storage, Networking, Security, and Messaging, with an objective to architect and implement a solution with our client’s best interests being paramount. Public and private organizations are struggling to keep pace with the increasing volume and sophistication of cyber-attacks. Major data breaches surface daily and the risk to Federal agency IT infrastructure and data continues to increase. Layering in additional specialized security devices may have limited impact, or worst case, may be a risky way of responding in today’s threat environment. How do you respond to mitigate risk and ensure resilient, reliable networks? It’s time for your firewall to step up. Next-generation firewalls are going through an evolutionary advancement – they are increasingly more dynamic, automated, and intelligent. If you have not done so lately, it’s time to update your knowledge about how an advanced firewall will improve your organizational security posture. Register today and become more informed on how to leverage current technology and methods for optimal, manageable, and affordable network defense. With all the hype around Cloud and SDN, federal decision makers are finding themselves trying to navigate through many new concepts and consequently needing to change the way they have traditionally selected their IT infrastructure. Technologies are now becoming more integrated and it is more important than ever to help your organization be agile enough to keep up with the demands of your users and your customers. 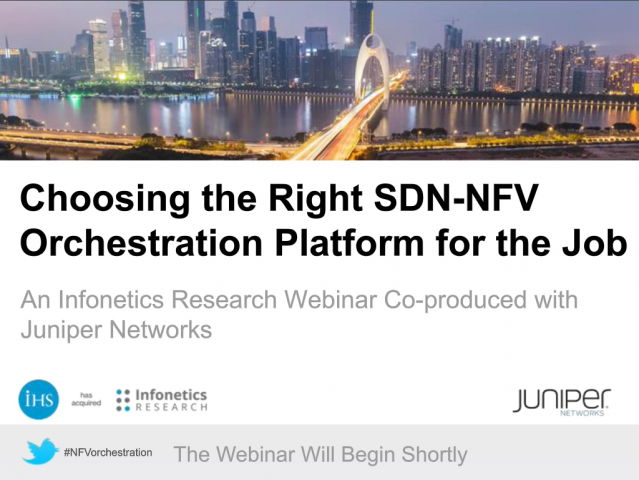 Come hear from Daniel McGinniss to learn about how Juniper Networks MetaFabric Architecture can help guide you on this journey to embracing Cloud technologies such as automation, SDN and Orchestration platforms to help you build next-generation networks for your agency. For nearly 15 years, Federal agencies have relied on Virtual Private Networks (VPNs) as the default method to provide mobile users with remote access to government information, communications, and applications. During this time frame, nearly every aspect of Federal Government networking has changed. The border between inside and outside the firewall has nearly evaporated, data and applications are migrating to the cloud, and hundreds of millions of mobile devices now require secure access to agency resources—regardless of user or data location. Following this introductory briefing, attendees will receive a complimentary copy of a recent publication by Forrester Research, Quick Take: Pulse Secure Spins Off, Immediately Acquires MobileSpaces, Good News for S&R Pros Seeking a Unified Solution for Mobile Device, App, And Data Security. Register today and attend on January 21st to learn how to empower your agency productivity through secure and seamless mobility. You’ve decided to implement unified communications in your business and are mandated to deliver a flawless user experience. Phone services and chat collaboration technologies are critical to supporting your customers and conducting day-to-day business—dropped calls and missed messages can mean lost business. Have you architected your network to meet the rigid performance demands to deliver uninterrupted services? Join this session to learn about top technical considerations for your network when deploying unified communications.